Thanks in no small part to Mr. Bizkit himself, Fred Durst, the road for Massachusetts-based Staind has been paved with good fortune almost from the instant the two bands met. Durst has basically mentored the band in songwriting, production, and touring. The live-recorded acoustic radio single "Outside," in which Durst duets with Staind vocalist Aaron Lewis, gave the band a jump start this year, launching them in radio play charts well before their latest album, Break The Cycle, was even released. 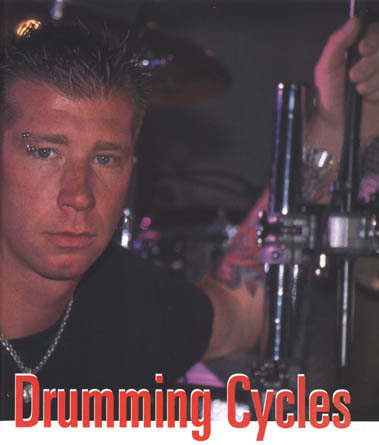 For Staind drummer Jon Wysocki, whether it be credited to a stroke of good luck, or the fact that he's got all his single and double strokes down, attention to his performance as a drummer has suddenly been elevated to a whole new level. Long gone are his days of being seen as just another rock drummer; Wysocki's laid-back and loose funk grooves, pocket fusion-jazz technique, and picturesque cymbal colorings are interspersed throughout the heaviness of Break The Cycle. And such playing perfectly complements his band's ethic of melding the sturdy with the fragile, as Wysocki proves with constant shifts in dynamics, all the while maintaining a consistent rock drive. MD caught Jon while on tour in Grand Rapids, Michigan. The drummer seems comfortable knowing that the incredible response his band has received isn't just a fluke —it's reality. MD: It appears as if you're quite the wanted man. With Staind's recent popularity, the offices at Modern Drummer have been swamped with requests to have you in the magazine. Do you receive a lot of fan mail personally? Jon: You know what? I don't even check email or stuff like that. I'm so lame, I don't even have a computer. I'd probably have trouble just turning the thing on. MD: So you're not all that computer savvy, but what about electronics savvy—specifically relating to your drumkit? Jon: Well, we're using ddrums right now, but my tech and my sound man figured out the whole thing. I have a set of Roland V -Drums, which I actually sat down and fooled around with. So I have a little bit of knowledge as far as that goes, but not a lot. I would not say that I'm schooled in that department. MD: Then let's talk about a department you're probably quite well versed in. How'd you get connected with Staind in the first place? were looking to get out of those things and into something different. So we talked about it, and the issue was finding a singer, which is always the most difficult thing to do. Mike said he had a line on someone, and it ended up being Aaron, and it came together fast. MD: And how about your start as a drummer? Jon: I used to bang on my mom's pots and pans as a young kid, and then when I was about five or six, my parents bought me a drumkit. I worked at it and took lessons, but I never took it too seriously until I was in middle school. Then I really, really got into it and listened to a lot of music. I heard KISS for the first time, Led Zeppelin and The Beatles and all that, and then just took it from there. MD: I'm assuming that John Bonham was probably one of the drummers you looked up to at the time. Jon: Definitely John Bonham, and I'd like to say Peter Criss. I know he's not the best drummer in the world, but I must say that I was influenced by his look more than any thing. MD: So would you consider yourself visual drummer? Jon: Ummm, not really—not like Tommy Lee or anything like that. But I think there is a visual element to the way I play because I have to play very hard in the band, so it looks very physical. MD: Has your hard drumming led to any health issues? Jon: I've been very lucky—no carpal tunnel. But my shoulders, arms, and back, yeah, they feel it after four or five shows in a row. MD: So what's your warm-up routine like? Jon: I run on a treadmill or bike for some kind of cardiovascular workout. And then I use very light weights. I just work on my chest, my shoulders, and a little bit of the arms—but no curls, though. This is usually earlier in the day. Before I go on, I just usually stretch. I definitely have to do that. MD: And what about your kit of choice? Jon: I'm playing OCDP [Orange County Drum & Percussion] drums. I love 'em. I ordered a kit that has a metal wrap on it, but I think I sacrificed the sound for the look. We beef up their sound live by triggering the drums, which are really low in the mix. MD: I noticed that you're particular about your dynamics, and aren't the type to bash straight through. You've got that finesse of, say, a Stewart Copeland. Would that be fair thing to say? Jon: Wow, that's a great comparison. I love Stewart Copeland, he's amazing. I grew up listening to The Police, as a matter of fact. They're another big influence. You proba­bly hear his influence in my playing because I use splashes—and China cymbals—a lot. I love the sound of 'em. They add a different element to the old rock feel. MD: Do you use your cymbals more for color or accenting? Jon: Both, actually. I think cymbals are a great way to accent, and dynamically, for breakdown and bridge sections that lead up into something bigger. MD: In what ways do you think Break The Cycle differs from your last record, Dysfunction? Jon: I wanted to go in there and have my grooves a little more mature. I really wanted to focus more on the song, rather than just throwing things in for the sake of throwing them in. I wanted to work for the music. Pre-production involved constructing the songs with the three musicians, and I'm excluding Aaron because it was me, Mike, and Johnny [April, bassist] who came up with the forms of the songs. Then Aaron would come in, and we'd break it down even more and figure out what we would keep or if we wanted to go in a different place at a certain area of the song. MD: Where did you record? Jon: It was at NRG in Los Angeles. I was done with the drum tracks in four or five days. I did bang 'em out, but the thing is that it all had to do with pre-production. I had the songs down in my head. I feel like once I get in there, I kind of get into this zone. It's tough for me in the studio, because I'm my own worst critic. I'll play a song fifty times, and then go back and pick each one apart. I'll just be like, "I don't know if that was good." But having other people in there helped—like our producer, Josh Abraham, and Ross Garfield, the drum doctor. Those guys were like, "God, that was a good take," or even when I felt like it wasn't a good take, they'd reassure me that it was okay. I get a little carried away sometimes. But in order to get the best possible product, you should be like that. I felt that this record was going to be a big one for us, and I just want­ed everything to be right. I didn't want to have to look back at it six months from now and go, "Man, I wish I hadn't done that!" MD: Are you speaking from past experi­ence? Jon: Yeah, our first demo was like that—all over the place. I hear it now and go, "Oh my God, what was I thinking?" MD: Do you rely on punch-ins and edits to correct any minor mistakes? Jon: No, not at all. We didn't use a click track, we just went straight through the songs. You get a better vibe that way. On our first demo, we punched in all over the place, but it disrupted the flow of the tunes. MD: So now do you feel comfortable in a recording studio? Jon: Well, I tell you what, if you're looking to hire me for studio work, I can probably bang it out pretty quickly. For some reason, I have good luck in the studio as far as getting tracks done fast. But I'd have to say that onstage is where I shine. Having the crowd right there, having the energy of the band— the whole vibe is more fun to me, whereas in the studio, there's a lot more pressure. MD: Speaking of the stage, you guys have shared the stage with Limp Bizkit a lot. How did you hook up with Bizkit vocalist Fred Durst in the first place? Jon: A friend of ours had a connection and got us an opening slot for Limp Bizkit. 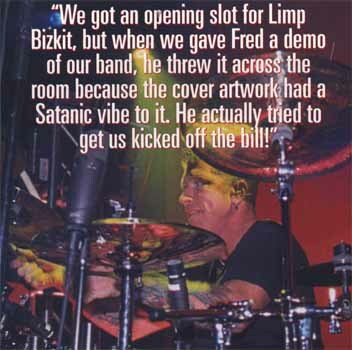 But when he gave Fred a demo of our band, he threw it across the room because the cover artwork had a Satanic vibe to it. He actually tried to get us kicked off the bill! He was kind of bent out of shape about it because he has a religious background. We were like, "Wait, no man, we're not Satan worshippers. It's just a cover." Well, Fred let us play. And then he actually stood on the side of the stage the entire time. He totally dug us. When we got off stage, he was like, "Yeah, I'm interested in working with you guys. I wanna hear new material." So within two or three weeks we brought him a tape and he loved it. We packed up and drove down to Florida and basically wrote our first record down there. MD: And what were Burst's contributions to shaping the band's sound? Jon: He set us in the right direction because Aaron was doing a lot more screaming. We were a lot heavier and metal-like, and Fred was telling him to smooth it out more and to sing. MD: Did Durst have much to say about your drumming in particular? Jon: Yeah, absolutely. He was like, "Don't just put something in to put it in. Do something that works." Fred's got that groove kind of feel, he knows about it. He comes from that hip-hop background. He knows what he's talking about. He'd be like, "Lay back and don't try and throw in these extra little kick drum hits or snare hits." And on other stuff, he'd just let me go. He was really cool to work with for sure. MD: Who have you been listening to for inspiration? Jon: I go to see Dennis Chambers whenever I can. He's just amazing. I can't believe what he does with one foot. He's just unbelievable. I'm a huge Chad Wackerman fan too. I like cats like that. MD: Speaking of funky players, I noticed you had some funky stuff on Break The Cycle. The opening track, "Open Your Eyes," has some funky verses right from the start. Tell me about that groove. Jon: That definitely goes back to my days of listening to Toto. I love Jeff Porcaro. And Dave Weckl's time with Chick Corea's band really inspired me. And there are rock guys; who are just like gods to me. Danny Carey from Tool and Morgan Rose from Sevendust are totally unbelievable. 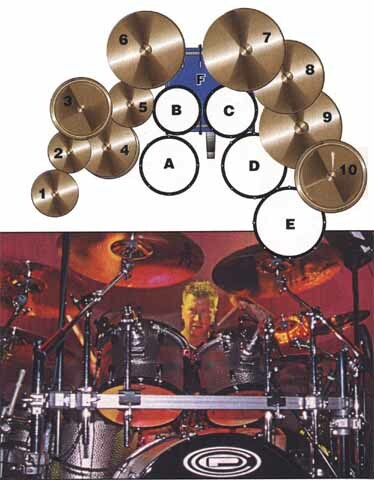 MD: But Carey, for example, utilizes more than just a drumkit for his sounds. Would you be open to incorporating new instruments or sounds into your current setup? Jon: I would love to play vibes or something like that someday. It's not really where we're headed right now, but I'm really interested. I've also got a long ways to go on the kit. You can never learn everything. I learn new things every day. I try to watch as many bands as I can. There are guys who tell me that they think I'm a great drummer. But have so much to learn.